This is a preliminary oil study for NPG 342. Since the original picture is almost invisible now, the study is particularly important. 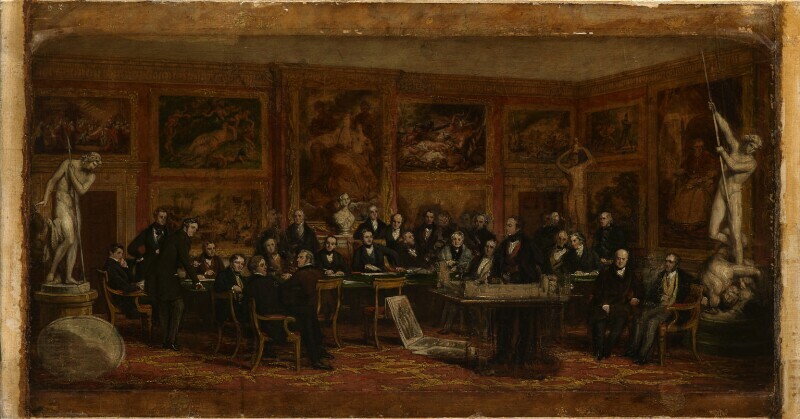 Three of the sitters are omitted in the study (apparently Hawes, Vivian and Knight), but it shows the same general disposition of the figures as the big picture. Some of the works of art are different, and others have been rearranged; Fuseli's Hamlet and the Ghost is shown instead of his Lazar House, and Bacon's Narcissus replaces his Flora. There are other slight differences in the furnishings and architecture of the room. The exact date of the study is not known. The figures are mainly in dark suits, with white shirts, and some with coloured waistcoats. The seats and arms of the chairs are covered in red material. The table is covered with green baize(?). The carpet is red with a gold pattern. The walls are dark red with a gold cornice and gold architraves above the mahogany(?) doors, and a light-greyish green ceiling above. The multi-coloured paintings are generally subdued in effect. The statues, bust and architectural model are off-white. The general effect is relatively sombre, but the colours have probably darkened. Presented by the artist, 1872.